In her personal life, Jordana works in marketing for Deloitte Canada. She is the (mostly) proud owner of two wiener dogs and lives with her husband in the Beaches area of Toronto. 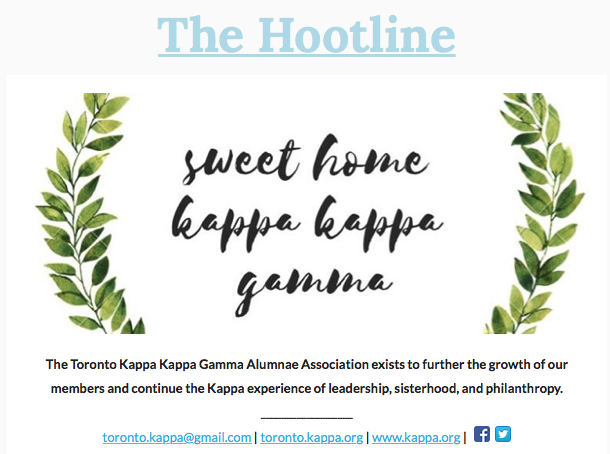 She looks forward to many more years of Kappa volunteering and is always happy to chat if anyone is interested in learning more about becoming a volunteer! 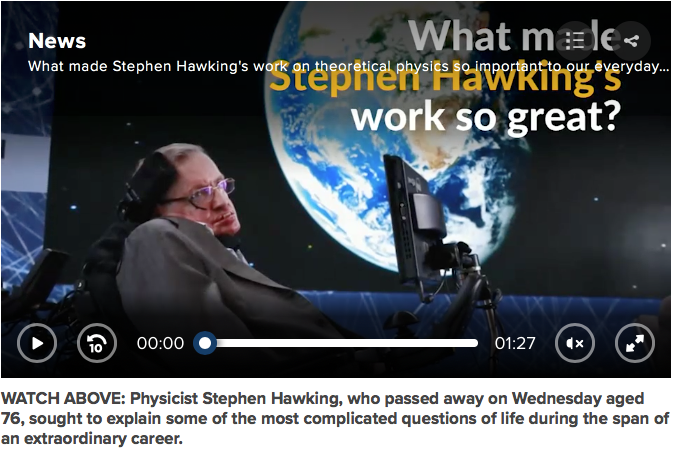 ​Stephen Hawking, who died Wednesday at the age of 76, developed ALS at the age of 21 – meaning he lived for more than five decades with the disease. Thousands of participants enjoyed perfect weather on Saturday for the five-kilometre Walk for ALS in support of people and families living with amyotrophic lateral sclerosis (ALS), commonly known as Lou Gehrig’s disease. Participants of all ages set out from the War Museum on Vimy Place at 11 a.m., heading west toward the Rémic Rapids area. The westbound Sir John A. Macdonald Parkway was closed for the event. The local ALS group had set a target of $250,000 for the fundraiser. As of Saturday evening, the total sat at about $170,000. The group will continue to accept donations until Dec. 31. To donate, go to als.ca and click on donate. It estimates that the cost of equipment and other care costs can exceed $200,000 per person over the course of the disease. Most of these costs are not covered by government funding or private insurance. This year’s lead walker was Carol Skinner, ALS Canada ambassador and ALS client. She has become well-known for her blog, Live Laugh Love with Carol. The annual 5 km "WALK for ALS" took place at the Canadian War Museum in support of those effected by amyotrophic lateral sclerosis (ALS), commonly known as Lou Gehrig's disease Saturday June 10, 2017. My name is Carol Skinner and it is an honour and a privilege to be here with you today. In fact, I was told I wouldn’t be. I was diagnosed with ALS on September 19, 2013 at the age of 41. That day I went in for an EMG, and walked out with 2-3 years left to live. This September, will be year 4. ALS has yet to steal my voice, and that is why I am here today. For those we have lost, those who are living with, and those who will be diagnosed with this devastating disease. I have learned lessons living with ALS, the most important being how precious life is and to appreciate everything you have, rather than resent what you don’t. I am very lucky to have been diagnosed with ALS when I was. Since then I have observed more initiatives geared towards the eradication of ALS than I believe the world has witnessed in over 100 years. -In October of 2016 parliamentarians and senators of All-Parties of the Federal Government came together to form an ALS Caucus. I was fortunate to attend the first meeting and was heartened to see the efforts of sincere and passionate politicians come together to play a vital role in addressing the needs and challenges of the realities of ALS. A big thank you to all of those who participate in the caucus despite their busy schedules. -In April of this year Motion 105 passed unanimously with a 280-0 vote. 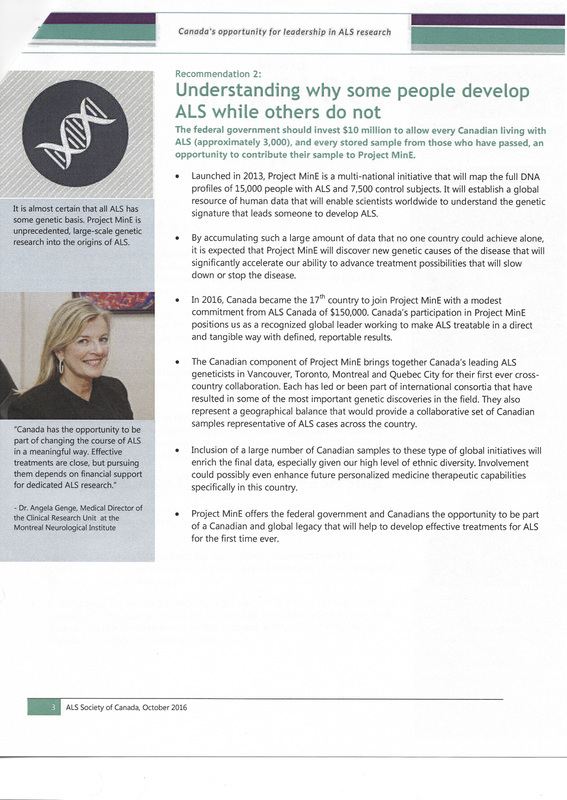 The motion states that the House combats ALS via research and awareness and calls on the Canadian Government to increase the funding for ALS research, and to substantially increase national efforts to develop and launch a comprehensive strategy to assist with the eradication of ALS at the earliest opportunity. -In light of this motion passing, I am waiting with baited breath to see action taken within our government, in particular to include in the next budget, sustainable research funding to combat ALS. In order for this to happen our community must be vigilant in our advocacy efforts and keep knocking on doors! This is what has happened since I was diagnosed almost 4 years ago, Imagine what could happen in the next few years! 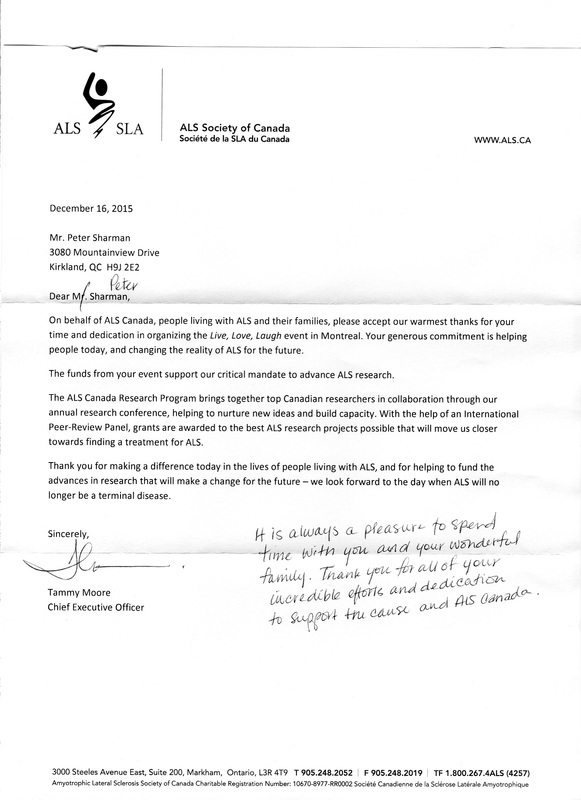 Thank you so much to the ALS Society of Canada for supporting us and for their relentless work in advocacy and care. Lianne Johnson, you are a rockstar, Tammy Moore, you lead with strength and conviction. Thank you to friends and family who have not given up on us, and who remind us who we are beyond ALS. Thank you to my amazing Mom & Dad who are always there for me no matter what. They moved from Montreal to Ottawa this spring and continue to give me reasons to keep on fighting. Thank you & enjoy the sunshine!!! 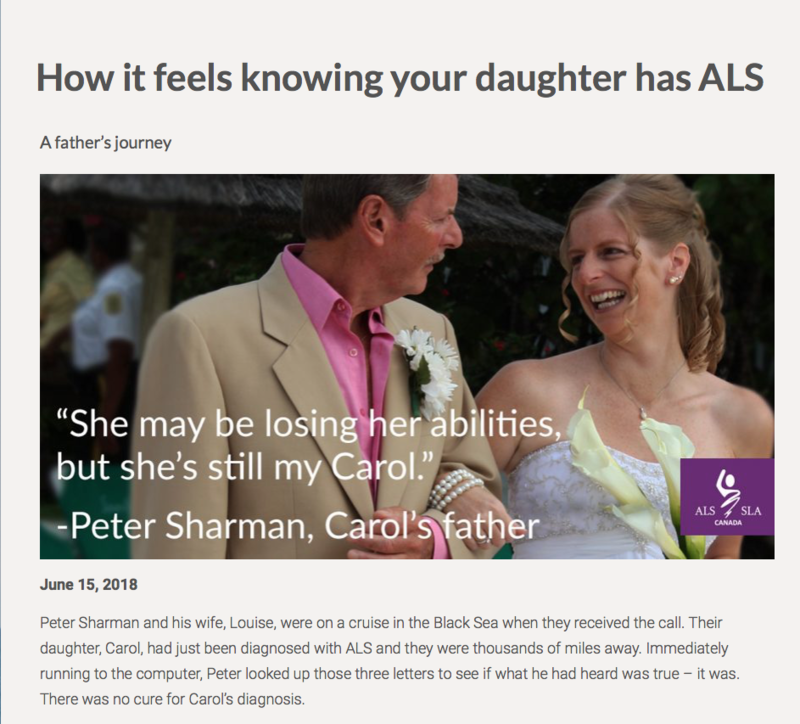 Diagnosed with ALS in September 2013 at the age of 41, Carol has surpassed the two to three year life expectancy that was originally given to her by her neurologist. Since then, she has struggled with degenerating muscle function every day – but she refuses to let that stop her. When she first received her diagnosis, Carol says her only regret was not travelling to Italy. She has since travelled to Italy twice and has learned to make the most of the time she has been given with the people who matter most to her. She continues to make travel plans for the future, despite not knowing if she will be well enough to go. In the past few years, Carol and her husband have travelled to Italy, Denmark, Sweden, Russia, Thailand, Antigua and England, to name a few. She says that crossing these countries off her bucket list has shown her that ALS is not an excuse to give up on her dreams. Carol and Travis in Portofino, ItalyOne of the biggest struggles for Carol while living with ALS has been accessibility. She says that 50 per cent of her waking hours are spent resting and the other 50 per cent are spent working on accessibility issues: for example, expensive wheelchair batteries that drain quickly and leave her in fear of venturing outside on her own, feeling like an observer of society rather than a participant, and loss of control and independence. 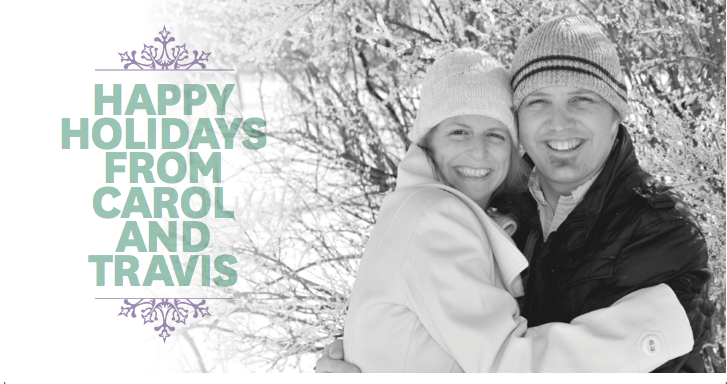 Carol’s diagnosis meant that she had to give up her career, her first home, her ability to drive and her dreams of a future with her loving husband, Travis. However, she is grateful for the time she has been given and the generosity of family and friends. If tragedy were to strike tomorrow, what is the one thing you would regret? 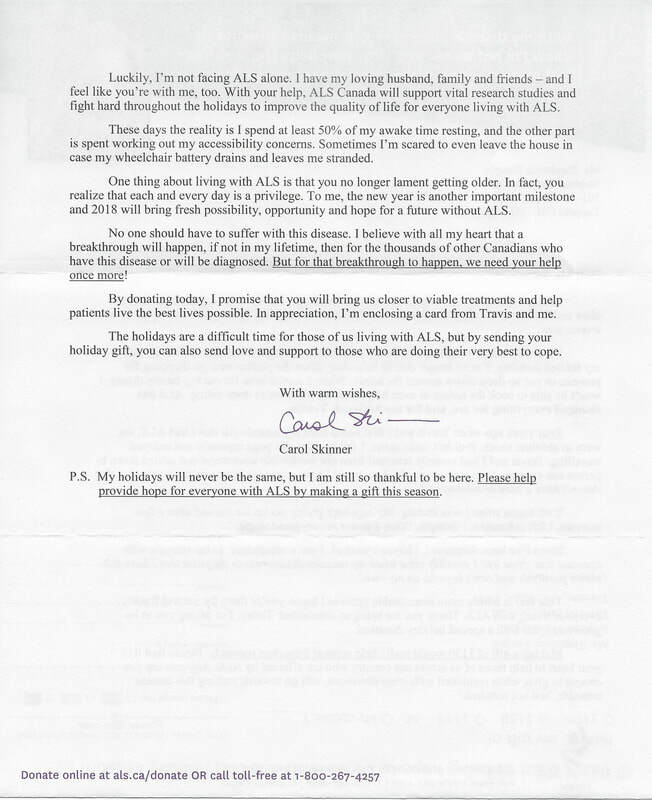 Carol’s relationship with ALS Canada started with the Ottawa Walk for ALS in 2014 as part of the “Living Loving Laughing Walkers” team, which has collectively raised over $17,000 for ALS research and client services. Since then, she has become an ALS Canada Ambassador and has been an advocate at the University of Ottawa, at the ALS Research Forum and at the first all-party ALS Caucus on Parliament Hill. Thanks to our generous donors, Carol has been able to access ALS Canada’s equipment program for practical needs like a new shower chair so she can continue to shower independently despite her weakening leg muscles. Carol Skinner was diagnosed with ALS on Sept. 19, 2013, a day she’ll never forget. I first met her in June 2015, when she had leg braces, caught up with her a year later when she used a walker, and saw her again Wednesday, when she explained the use of three different wheelchairs, lamented an inability to hold a plate or drive a car, revealed she can’t bend over to pick anything up. So does amyotrophic lateral sclerosis steadily shrink your world. And she is one of the lucky ones. “The hardest part is that you witness it,” she said of the effects of the terminal neuromuscular disease, which progressively weakens the use of major limbs. After diagnosis, she was told she might have two or three years to live, maybe five. Now she’s in year four and, all things considered, doing rather well, just as she’s seen friends and acquaintances die, and witnessed the demise of MP Mauril Belanger, who had less than a year between diagnosis and death. Amazingly, her optimism is not impaired. “That’s why I kind of feel like I’ve been given a gift,” she said, sitting in a special chair in the ninth-floor apartment she shares with husband Travis and two cats. The gift is time. In January 2016, the federal government extended the Compassionate Care Benefit, extending from six to 26 weeks the period during which caregivers can apply for benefits up to $13,624 to care for loved ones with ALS. In October 2016, the first meeting of the ALS caucus on Parliament Hill was held. A group of MPs and senators is now focusing its attention on how to improve care, research and funding into the incurable disease. In February, Skinner and senior ALS officials met with Health Minister Jane Philpott to advocate for ongoing research funding. In the U.S., the FDA has approved the use of edaravone (or Radicava), a drug that has shown promise with a small sample of ALS patients. Later in 2017, The Ottawa Hospital will open the Neuromuscular Clinical Research Centre at the Civic campus. It will have a major focus on ALS. Dr. Jodi Warman Chardon is a neurologist at The Ottawa Hospital and one of the centre’s leaders. “We’re going to be offering international, world-class trials in Ottawa,” she said Thursday, the kind not available anywhere in Canada. 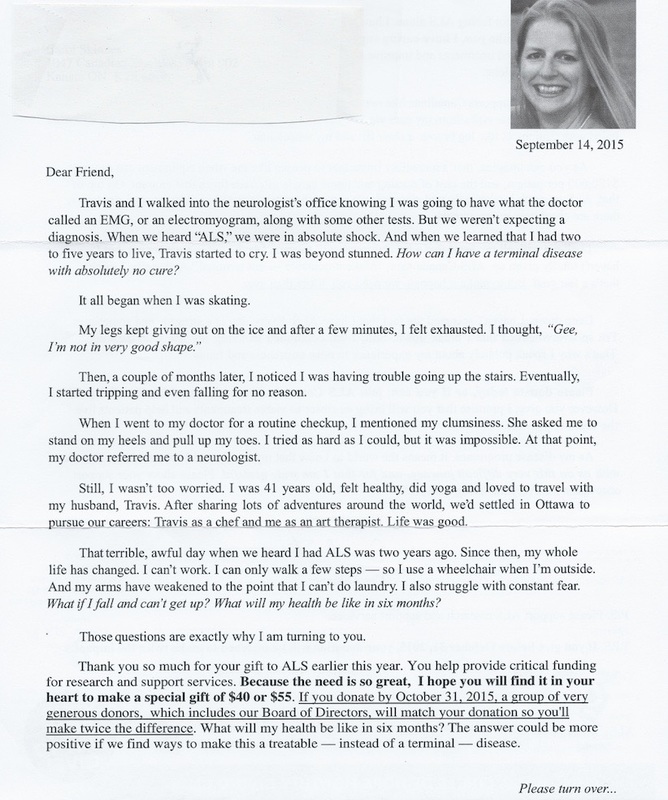 She said ALS has been so difficult to treat because it appears to be a “demonstration” of multiple different diseases. Genetic ALS, for instance, has some 30 sub-types and that only represents about 10 per cent of all ALS cases. This may be an explanation as to why the disease kills some people so quickly yet allows others to live for 10 or more years. 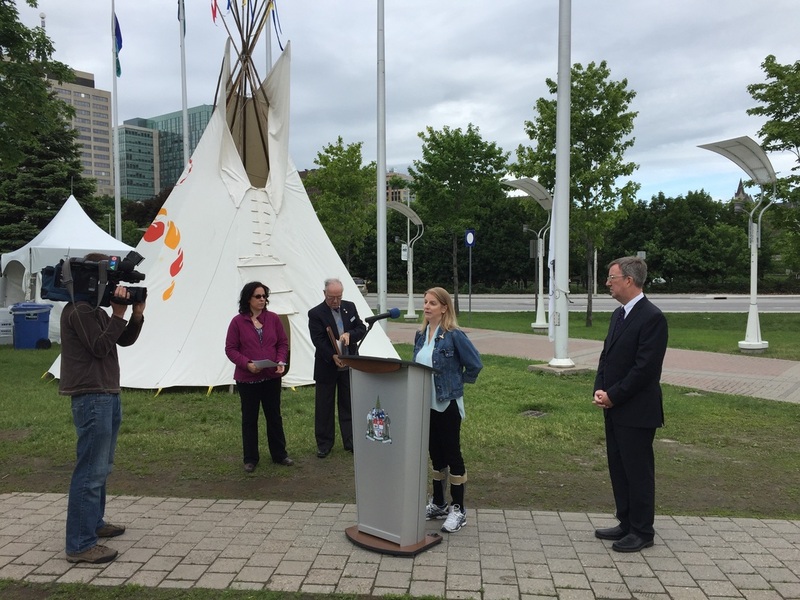 Skinner, meanwhile, is the Lead Walker at the annual ALS walk on Saturday, a five-kilometre loop from the Canadian War Museum. She hopes to raise $3,000 on her own, adding to the $17,000 her teams have raised since 2014. (Donations can be made online at walkforals.ca). The tough part, she says, is the visible slipping away, the knowledge of what’s coming. 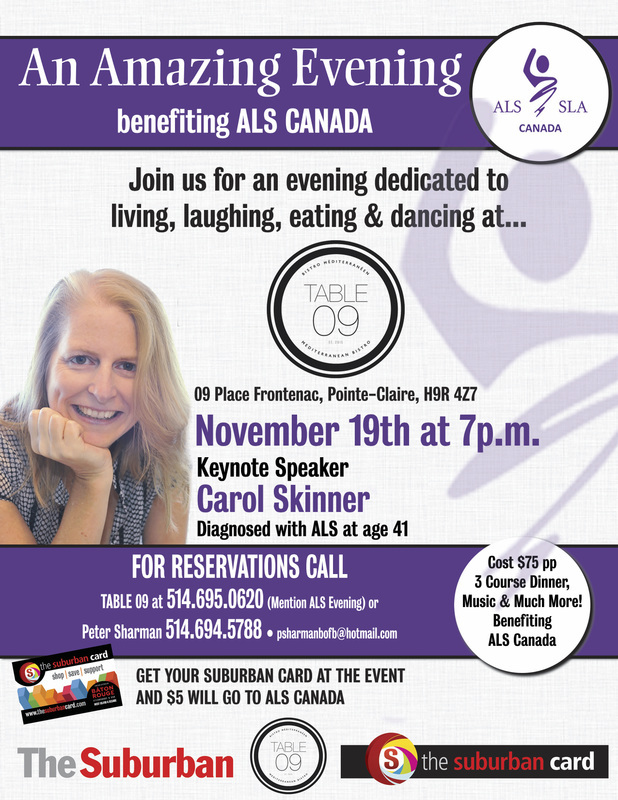 My name is Carol Skinner and I was diagnosed with ALS on September 19, 2013 at the age of 41. That day I went in for an EMG, and walked out with 2-3 years left to live. ALS stole my career, my home, my future, my sense of adventure and my control. ALS is a serial killer that has a hold of me and there is nothing anyone can do about it. It is slowly stealing my physical abilities, bit by bit, day by day, until I become paralyzed in my own body, as my mind remains fully aware of what is happening to me. Even then, it isn’t satisfied, it will keep attacking my body, and will take everything from me, including my last breath. 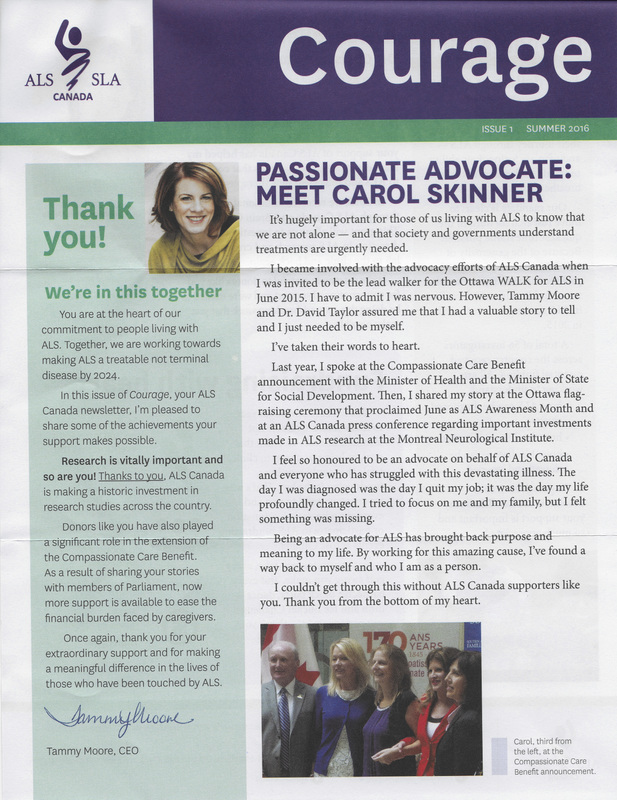 ALS has yet to steal my voice, and that is why I am here today, to advocate on behalf of all Canadians. For those we have lost, those who are living with, and those who will be diagnosed with this devastating disease. Why is it important to raise awareness for ALS? -ALS can strike anyone, at anytime. 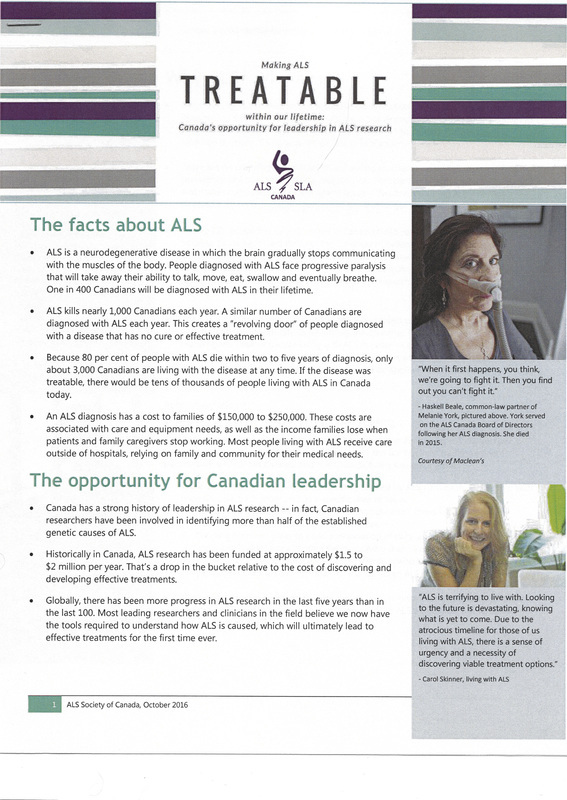 ALS does not discriminate by age, gender or ethnicity. -Once thought rare, ALS is in fact quite common. The life-time incident rate for an average person is often estimated at 1 in 400 people (1). Think about that the next time you are on a plane, chances are, at least one of those passengers is likely to be diagnosed with ALS if they haven’t been already. -If this is the case, then why are there not more than 3,000 Canadians living with ALS at one time? Because ALS kills, and kills quickly. 80% of people living with ALS die within 2-5 years (4). This September will be year 4 for me. -Many other illnesses have developed treatments over the years and those who were once terminal can now live a happy healthy lifestyle with treatment. I just want the same chance and opportunity for those of us living with ALS. I have learned lessons living with ALS, the most important being how precious life is and to appreciate everything you have rather than resent what you don’t. I am very lucky to have been diagnosed with ALS when I was. Since then I have seen more initiatives geared towards the eradication of ALS than I believe the world has witnessed in over 100 years. -In October of 2016 parliamentarians and senators of All-Parties of the Federal Government came together to form an ALS Caucus. I was fortunate to attend the first meeting and was heartened to see the efforts of sincere and passionate politicians come together to play a vital role in addressing the needs and challenges of the realities of ALS. 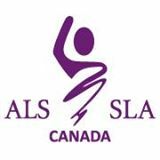 It is Walk Season and one of the most important fundraising initiatives for the ALS Society of Canada. Please consider joining a team or sponsoring a Walk for ALS near you. I am so grateful to my team the “Living Loving Laughing Walkers” here in Ottawa. When I received my ALS diagnosis in 2013, I was given two to three years to live. I was 41 years old. I had settled into a rewarding career – art therapy – and I was happily married to the man I love. Learning I had ALS and that “there was nothing the doctors could do to help” was devastating. I spent days filled with shock, depression, and a feeling of helplessness. My physical condition was deteriorating rapidly, so my husband, Travis, and I had to move out of our condo to an apartment that was more accessible. That was hard because it meant facing the reality of what lay ahead. But perhaps the most difficult adjustment was having to leave my job. I felt like a core part of me was ripped out of my life. Something was really missing. Volunteering for ALS Canada has given me back hope and purpose. I have received so much positive feedback from people, and really, I feel as though all I do is show up. I’m the one getting back more than I’m giving! I’ve already beaten the odds, so while I can still speak and I still have enough energy, I just want to keep doing everything I can to help the cause. 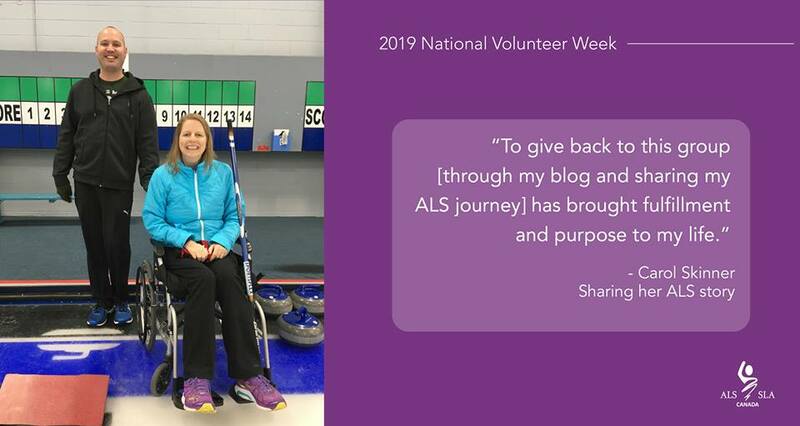 I am truly grateful for the advocacy work I do as an ALS Canada volunteer because I know that sharing my story will help build awareness, which will lead to more people becoming involved and more funding available to bring us closer to a cure. 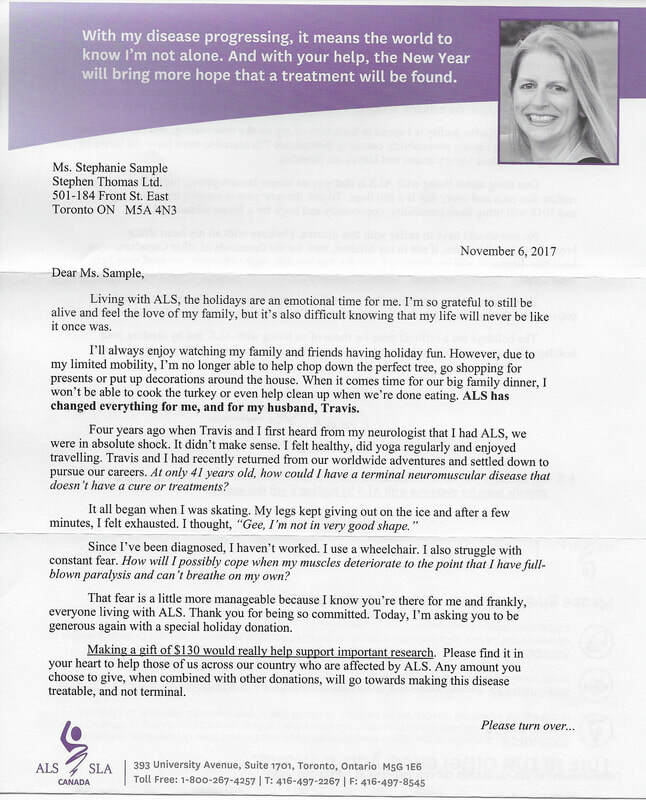 When I first signed on as an ALS Canada volunteer, I had no idea where it would all lead. Gathering my team “Living Loving Laughing Walkers” for the Ottawa WALK for ALS in 2014 was really what got me started. The response from people was overwhelming. We exceeded our fundraising goal, and I was comforted by the flood of support around me. I was too sick to participate in 2016, but since my team has been part of the WALK we have raised more than $17,000 for ALS research and vital, practical services like the bath chair that was provided for my apartment recently so I can sit in the shower — I can no longer manage without it. I remember seeing the Ice Bucket Challenge in 2014 and feeling for the first time that the world had my back. In the summer of 2015, I knew we had to keep the momentum alive so I set up my own Ice Bucket Challenge online. Friends and family in Ottawa helped organize other fundraising events too, including an annual bonspiel, Curling for Carol, that we’ve held for four years in a row now. 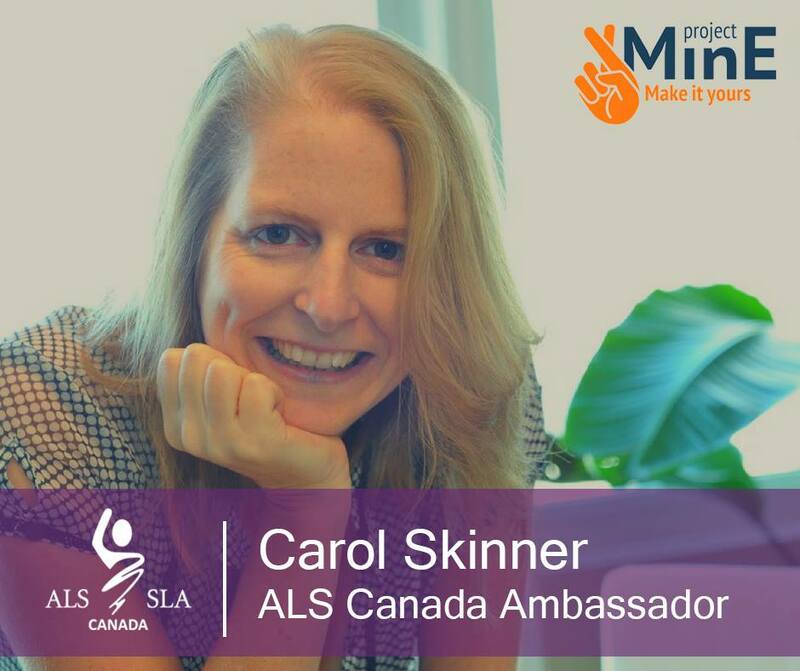 The events have been uplifting and inspiring, but perhaps the place I feel I’ve really made a difference is in my role as an ALS Canada Ambassador. Speaking at the University of Ottawa about the impact of receiving an ALS diagnosis, delivering a speech attended by more than 300 Canadian and international ALS researchers at the annual ALS Canada Research Forum last year, and participating in the first meeting of the all-party ALS Caucus on Parliament Hill in Ottawa are positive steps that help raise awareness and capture the attention of key stakeholders. All of this just serves to remind me that I don’t just have to sit back and watch this happen to me – I can do something. It’s very empowering! The inscription for her award reads “For her commitment to the values of Non Nobis Solum in the world beyond camp, shown through her enormous personal strength, determination and dedication to the fight against ALS for herself and others". I am so grateful for what Camp Kanawana has taught me. It made me into the woman I am proud to be today. I graciously accept this award, but it is really on behalf of all Kanawanians, with a special shout out to those who shared my experience from 1990-1995. My old campers, CIT’s, and staff hold me up and support me 20 years later. On September 19th, 2013 I was diagnosed with ALS. Kanawanians from all over the world sent me words of encouragement, helped me to fundraise, and showed up to events. They helped me to feel that I was never alone in my illness. My first year as a junior girl counsellor I was scared to be at this place where it felt like everyone knew each other, knew the songs and the cheers, knew where everything was, it was intimidating. I jumped in with both feet and ended up in the Katimivik in front of the whole camp translating with my terrible French for the camp director. Instead of feeling embarrassed by my terrible grammar, it was something to laugh along with. There may something about camp that just isn’t your thing, perhaps you feel shy singing at a campfire, maybe you don’t think you are the best swimmer, or maybe you are afraid to try something new. I remember going on my very first canoe trip. Trip leader Steve Henle asked me if I could canoe. “Of Course!” I replied, after all, I had gone canoeing a few times over the summer on the lake with my campers, and of course we had to canoe to get to our overnights, didn’t that make me an expert? Well, as we pushed off for our 5 day trip to explore the beauty of Papineau-Labelle my canoe went all over the place and was wonky as could be. Steve good naturedly paddled up and asked about my J-Stroke. “Um, well, sort of…” Somehow I had gotten away with never properly learning one, too embarrassed to admit it, in fact, I probably had let my campers stern all summer long! Well, nothing teaches one how to canoe like being thrown into a 5 day canoe trip! I’ll never forget that trip, the laughter, picking blueberries, climbing the firetower, silliness around the campfire, and of course at the end, I had become a master canoeist. It is now extremely frustrating to not be anywhere but in the stern of a canoe! So be silly, dress up for tacky day, get hyped for all camps, sing in front of a campfire, always do what you are afraid to do! You have no idea the effect you have on others. At some point we are all afraid of fitting in, making friends, maybe looking dumb. Whether you are a camper or staff you can make a difference to others. It can be as simple as a friendly smile, an offer to sit next to you, or a compliment. You can change someone’s life. When I was at camp one of the campers was bullied at school, she was tall for her age and somewhat socially awkward. At Camp Kanawana she was included and felt safe for the first time in her life. I promise you, when you become an adult, being different from everyone else, becomes the cool thing to be, and that is where people find success in life! I’ll never forget the Chief’s talk, at the time the Camp Director was Bruce Netherwood, who inspired us all. He spoke about how often we are looking around the corner to what is coming next in our lives instead of appreciating what we have right in front of us, right here, right now. I am a planner and thought, “Hey, that’s what I do!”. So stop and take a moment to smell the roses, hug your friends, and love where you are in this beautiful spot Kamp Kanawana. What I’ve learned from this magical place, my skills, my confidence, my creativity all leads back to Non Nobis Solum. At that same chief’s talk, our Director looked around the room and said if any of you want to be Camp Director you can. I thought “How cool would that be? I would LOVE that job!!!”. Well, a few years later, I fulfilled my dream of becoming one. Since then, I’ve travelled the world, gone back to school and achieved a Masters in Art Therapy, have given back to others by working in addiction and mental health, and continue to find meaning and purpose in my life by being an advocate in the fight against ALS. I can say I have had an amazing life. This is what the people and spirit of Kanawana has done for me. Carol Sharman Skinner, a tireless advocate for people living with ALS and a former Camp YMCA Kanawana staff member, is the recipient of the 2016 Camp YMCA Kanawana “Pip” Award. Ms Skinner is the ninth person to receive the award, established in 2007 to recognize the contributions of distinguished Kanawana alumni. The “Pip” Award is given annually to a former camper, counsellor or supervisor at Camp YMCA Kanawana who best exemplifies the values of selflessness and contribution to the community. The award is a memorial to Philip “Pip” Caddell (1913‐2004), Second World War officer, Montreal executive and community volunteer, and his grandson, James Caddell (1973‐2005), UN Peacekeeper, NGO Worker and public servant. Both attended Camp YMCA Kanawana – “Pip” as a camper in 1928 and James as a camper and counsellor in the 1980s and 1990s. The “Pip” Award Committee is composed of Kanawana alumni. Previous recipients include Richard “Itche” Kerr, a volunteer working with the physically challenged; Richard Patten, former Ontario cabinet minister; Stuart McLean, broadcaster and author; Bruce Netherwood, YMCA leader and author; John Cleghorn, former CEO of the Royal Bank; the late Sam Lazarus, NGO volunteer and the Lazarus family; Jeniene Philips Birks, former broadcaster and community volunteer; and Terry “Aislin” Mosher, editorial cartoonist and supporter of the disadvantaged. Camp YMCA Kanawana has been contributing to the well‐being and success of youth ages 7 to 20 for over 120 years. Children take part in a safe and unique outdoor experience while learning about the environment and sustainable development. A study by the American Camp Association has shown that the camp experience has a positive long‐term impact on the quality of life and life skills of youth such as self‐esteem, leadership, environmental awareness, and the ability to develop lasting friendships. Established in 1894, Camp YMCA Kanawana was the first summer residential camp in Québec. It is accredited by the Association des camps du Québec and is a founding member of the Association. For more information, see www.ymcakanawana.com or our Facebook or Twitter pages. On September 19, 2013, Carol Skinner was diagnosed with ALS. Together with her husband, Travis, she created a website designed to, as she states it, “stay in touch with friends and family, to update everyone on my status, and to include loved ones in our journey”. The message on her site is both focused and inspirational. She describes the deep love and affection her and her husband share, she showcases the exhuberance they feel when traveling the world, and she writes engagingly about her life and the importance of seizing the day. The photo gallery on the site is a wonderful illustration of her life experiences. 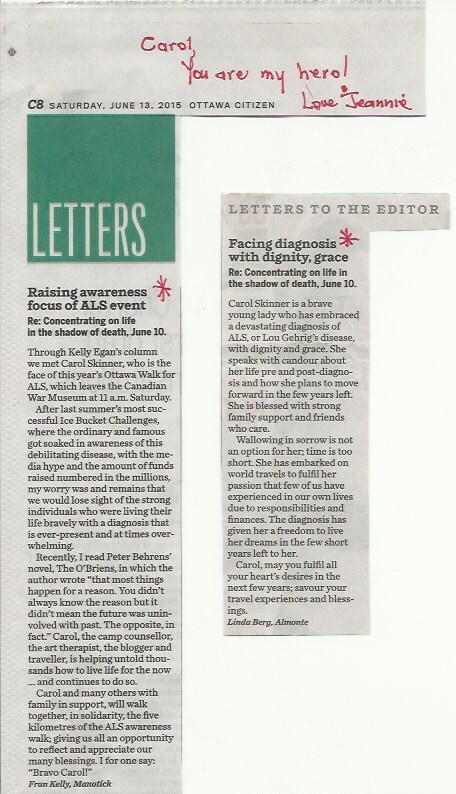 Carol has received honours and plenty of media coverage for the important work she does in support of ALS Awareness. Check out her blog and seize a few moments to hear her story. Carol Skinner is pictured at the ALS Walk in 2015. ASHLEY FRASER / . June is ALS month, 30 days to take a second to consider their every waking hour. Are there moments, or even hours, when she is watching a sunset, maybe, or absorbed in a movie, or in her husband’s arms, when she does not think about the terminal illness? And she passes along a remarkable story about the here-and-now. The youngest of three children, she was at a family gathering in Montebello in March when the warmth of the reunion was interrupted by terrible news. Her older brother, Don, only 53, was on a boat with friends in the Caribbean when he dropped dead of a heart attack. 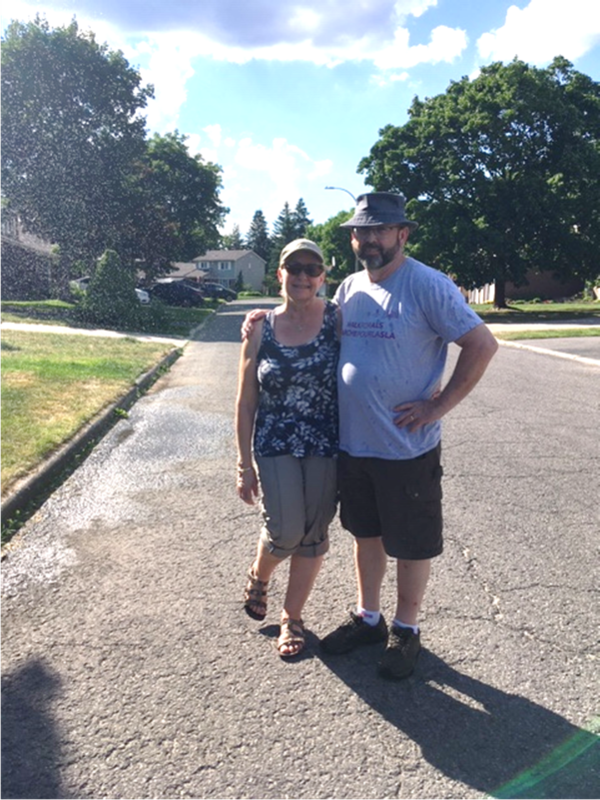 He had travelled to Ottawa in 2014 to support Carol during the annual ALS Walk. Wasn’t she the one, after all, with the emptying hour-glass? So she is doing what she can, squeezing in all the travel and advocacy her condition will permit, in a city that is witness to the rapid demise of Mauril Bélanger, the Ottawa-Vanier MP bravely working in the House of Commons in the throes of the illness. So live, urgently. What else is there, really? Carol is travelling to the Saint Sauveur, Que., area in July to receive an award for her advocacy for ALS, for which there is no cure or effective treatment. And in August, she is due to take a Scandinavian cruise with family, including husband Travis, with a stop in London. There are those living with ALS and the rarity that is Karen Lawrence, who wakes with ALS on the horizon. In January 2014, she underwent genetic testing to determine if she was a carrier of the mutation that had claimed some 14 members of her extended family, over three generations, including her father. She was. She is so far free of the disease and in good health. But it’s coming, she said. So, how to cope? Run, it turns out, as fast as you can. Karen Lawrence is part of a family that has lost 14 members to the ALS, including her father, Wayne Hovey, who died at age 60. PAT MCGRATH / . Lawrence, 39, runs five times a week, piling up between 40 and 80 kilometres, depending on training schedules. She completed her first marathon in Copenhagen in May and plans to run the New York City classic in November. Each is a fundraising opportunity, at which she excels. There have been two ALS golf tournaments, so far raising about $40,000. This year’s effort, in August, should raise another $60,000. When she runs in New York, she hopes to generate at least $10,000. In 2014, her team raised $14,000 at the annual ALS walk. Running, she says, is a way to literally and psychologically put one foot in front of the other. Her hope is with research. She is taking part in a clinical trial with a Miami team that is studying so-called familial ALS, which strikes about 10 per cent of sufferers. And she is passionate about raising funds for the already-named Neuromuscular Clinical Research Centre, which The Ottawa Hospital hopes to open on the Civic campus in 2017. Lawrence is one of the most positive people you’ll ever meet, though she works in an oncology unit. So we are. June is ALS month — pass the hours, or spend them — in time, the ledger precious. Saint-Sauveur (Québec), June 15, 2016 – Carol Sharman Skinner, a tireless advocate for people living with ALS and a former Camp YMCA Kanawana staff member, is the recipient of the 2016 Camp YMCA Kanawana “Pip” Award. Ms Skinner is the ninth person to receive the award, established in 2007 to recognize the contributions of distinguished Kanawana alumni. The YMCAs of Québec is a charitable organization that builds stronger communities by providing opportunities for everyone to lead fulfilling, active, healthy and engaged lives. Its 10 YMCA centres, International Language School, Residence, Camp YMCA Kanawana and its 40 service sites across the province are visited each year by more than 120,000 people. The first YMCA in North America was founded in Montréal in November 1851.The YMCAs of Québec is part of the Canadian network of 48 YMCA associations. For more information, visit ymcaquebec.org or our Facebook and Twitter pages. Saint-Sauveur (Québec), le 15 juin 2016 – Carol Sharman Skinner, défenseure infatigable des personnes atteintes de la SLA et ancienne employée du Camp YMCA Kanawana, est la lauréate du Prix « Pip » 2016 décerné par le Camp YMCA Kanawana. Mme Skinner est la neuvième récipiendaire de ce prix créé en 2007 afin de reconnaître les contributions de distingués anciens de Kanawana. Le prix « Pip » est décerné annuellement à un ancien campeur, moniteur ou superviseur du Camp YMCA Kanawana qui exemplifie le mieux les valeurs d’altruisme et de contribution à la communauté. Il a été créé à la mémoire de Philip « Pip » Caddell (1913‐2004), officier lors de la Deuxième Guerre mondiale, dirigeant et bénévole dans la communauté montréalaise, et son petit-fils, James Caddell (1973‐2005), membre de la force de maintien de la paix de l’ONU, travailleur dans une ONG et fonctionnaire au gouvernement fédéral. Tous deux ont fréquenté le Camp YMCA Kanawana – « Pip » en tant que campeur en 1928, et James à titre de campeur et de moniteur dans les années 1980 et 1990. Le comité du prix « Pip » est composé d’anciens de Kanawana. Les lauréats précédents de ce prix furent Richard « Itche » Kerr, bénévole oeuvrant auprès des personnes ayant un handicap physique; Richard Patten, ancien ministre du cabinet de l’Ontario; Stuart McLean, communicateur et auteur; Bruce Netherwood, dirigeant du YMCA et auteur; John Cleghorn, ancien président et chef de la direction de la Banque Royale; feu Sam Lazarus, bénévole oeuvrant dans une ONG et membre de la famille Lazarus; Jeniene Philips Birks, ancienne communicatrice et bénévole dans la communauté; et Terry « Aislin » Mosher, caricaturiste politique et défenseur des démunis. Le Camp YMCA Kanawana contribue au bien-être et au succès des jeunes de 7 à 20 ans depuis plus de 120 ans. Les enfants vivent une expérience unique et sécuritaire en plein air tout en en apprenant davantage sur le développement durable et l’environnement. Une étude menée par l’American Camp Association a révélé qu’une expérience au camp a un impact positif à long terme sur la qualité de vie et les habiletés sociales des jeunes, incluant l’estime de soi, la conscience de l’environnement et la capacité de nouer des amitiés durables. Premier camp de vacances établi au Québec en 1894, le Camp YMCA Kanawana est accrédité par l’Association des camps du Québec et un membre fondateur de l’Association. Pour plus d’information, visitez notre site Internet ymcakanawana.com ou nos pages Facebook ou Twitter. Les YMCA du Québec sont un organisme de bienfaisance qui bâtit des communautés plus fortes en offrant des occasions d’épanouissement et de vie active, saine et engagée pour tous. Ses 10 centres YMCA, son École internationale de langues, sa Résidence, son Camp YMCA Kanawana et ses 40 points de service à l’échelle de la province sont fréquentés chaque année par plus de 120 000 personnes. Le premier YMCA d’Amérique du Nord a vu le jour à Montréal en novembre 1851. Les YMCA du Québec font partie d’un réseau canadien qui compte 48 Associations YMCA. Pour plus d’information, visitez notre site Internet ymcaquebec.org ou nos pages Facebook ou Twitter. My name is Carol Skinner and this is my loving husband Travis, it is an honour to be with you today. I was diagnosed with ALS on September 19th, 2013, at the age of 41. The day of diagnosis I went in for an EMG and walked out with 2 to 5 years left to live. It is a day that those of us living with ALS will never forget. It is an unwanted anniversary that starts us on a ticking clock, counting down the days we have left. At the time, I had been working as an art therapist, facilitating groups for individuals with mental health and substance use disorders at the Canadian Mental Health Association. I began experiencing symptoms earlier that year. In fact, I took my South African husband ice skating on the Rideau Canal in February, and instead of skating circles around him as I used to, my legs could not hold me up. I shrugged it off to a long winter of not doing enough exercise. That April, I went to Travis’s brother’s wedding in Namibia. I fell, tripping over my own feet on at least 5 separate occasions during the trip, twice during the wedding reception, I’m sure guests thought I had a few too many! That July I went for a physical and my doctor asked me to stand on my heels, simple right? I couldn’t do it, and my brain was confused, it was telling my feet what to do, but they just wouldn’t listen! Until my brain came to the conclusion that standing on your heels must be impossible for everyone! When the neurologist diagnosed me, Travis and I did exactly what he told us not to, we went home and Googled ALS. The end result, was that we felt completely alone. Realizing that I have a terminal disease, that no one understands, with no treatment, no cure, and absolutely no hope. Immediately I had to give up my career that I was proud of because I lacked the strength in my muscles and experienced extreme fatigue. We had to sell our home as it was a two floor walk-up and I could no longer climb stairs. I remember the exact moment I got stuck on the sidewalk, knowing that if I were to take another step, my legs would collapse. That was also the day I had to come to terms with the fact that I could no longer drive. After simple tasks, such as taking a shower and brushing my teeth, I need to rest. Any activity, even having coffee with a friend, feels like a full day of work. ALS, being a degenerative disease is terrifying to live with. Its progression takes away ability and autonomy. Day by day I discover activities I can no longer accomplish on my own. As a strong independent woman with a Type A personality, this is extremely frustrating. Looking to the future is devastating, knowing what is yet to come. I am very conscious of time and do not take it for granted. Due to the atrocious timeline for those of us living with ALS, there is a sense of urgency in the necessity of discovering viable treatment options. I know how lucky I am, how others are further along in losing their battle with ALS. I am here to provide a voice for those who can’t be, for those who are struggling and suffering and are in desperate need of your help. ALS is not only taking away my motor function, it has stolen my future, and also my dreams. At one point, I thought it had stolen the essence of who I am as I struggled to find meaning, purpose and a reason to live. Advocating on behalf of those living with ALS has brought meaning back into my life. I am grateful to be provided with this opportunity to keep the momentum of advocacy for ALS alive. To plea with our community to continue to raise awareness and much needed fundraising for research to find a treatment and cure. The ice bucket challenge bought such needed awareness to ALS. Finally people around the world were talking about this unknown, understated and extremely underfunded disease. Hope, as carol has touched on, finally started to arrive for those people who's life has been so drastically devastated by this illness. Nothing can be done about ALS without funding. I remember watching the news everyday as the figures continued to rise from donations during the 2014 ice bucket challenge. To everyone that took part we are eternally grateful. 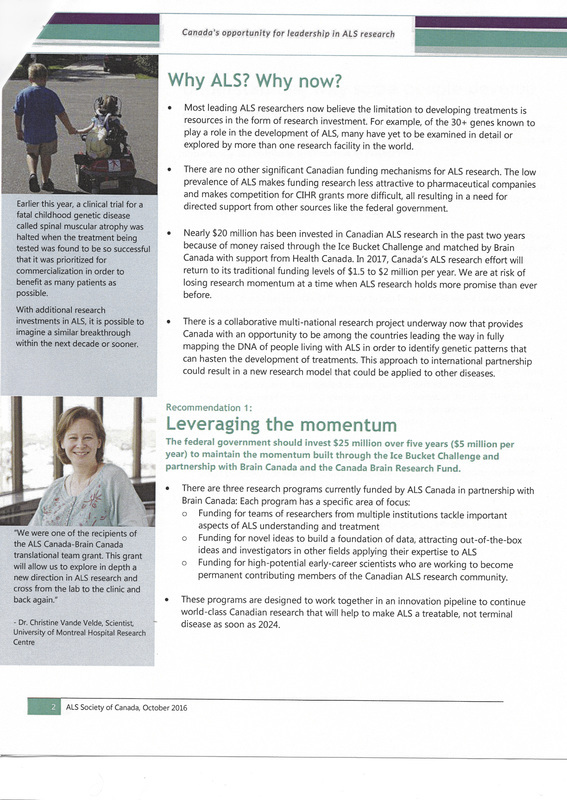 At last ALS Canada and ALS foundations around the world started getting the much needed resources to make a differences and ensure that research is front and foremost. But it just can't stop there. We don't have a cure yet. ALS has received more attention in the last 2 years than it ever has, but there is still no concrete answers to this disease. Advocacy and funding has to continue, in order for research to continue. The ice bucket challenge has been great, and we encourage people to get together each year and continue its legacy every August until a cure. We also need to come up with new ideas. Everyone can raise funding and build on awareness no matter how big or how small. Carols father for example has put together fundraising events in his local community. Using his contacts and friends he has put together fun and engaging evenings at local restaurants were people have not only been informed and educated about ALS but also had a great meal and a fun evening. As he advertised and the word spread radio stations got involved and an article ended up in the local newspaper. Their may have only been a hundred or so people at the event but it's a group of people who's lives have been changed forever and they now too wont to make a difference in the fight against ALS. Every bit counts in insuring that hope stays alive and we can look to the future and tell people that ALS is a thing of the past. The word “Hope” is often an overused term, sometimes even offered up as a cliché. But for those of us living with ALS, Hope is what can make the difference between life or death. ALS takes hope away. You are those who can give it back to us. Because of your support, as an individual living with ALS, I no longer feel alone. I now have hope where I once had none. Thanks to continued investment in ALS research, I believe that making ALS history will be an inevitable accomplishment and a day we can all be proud to celebrate. ​Thanks to a $15 million investment in Amyotrophic lateral sclerosis (ALS) the vision of making ALS treatable gives former West Islander and spokes advocate for ALS, Carol Skinner hope as she battles the deadly disease. 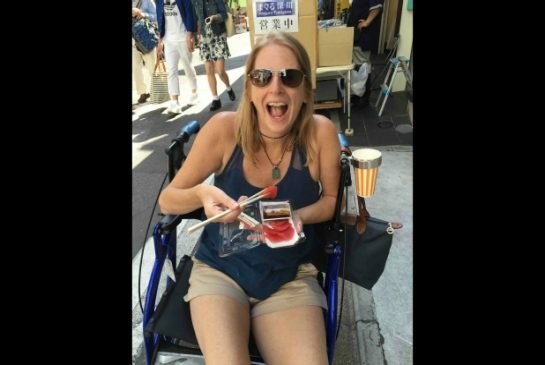 Carol shares her wisdom and experiences about living with ALS on her blog http://www.livelovelaughwithcarol.com . I'm at 12 minutes & 04 seconds. 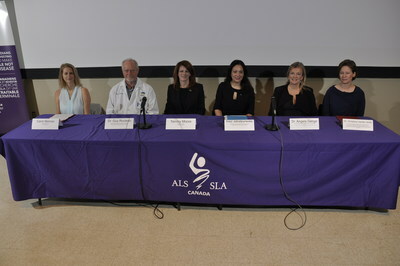 ALS Society announces historic investment in ALS research. The success of the ice bucket challenge has led to a huge increase in the money that's available for research into ALS. ALS (also known as Lou Gehrig's Disease) is a progressive neuromuscular disease in which nerve cells die and leave voluntary muscles paralyzed. More than 200,000 Canadians took part in the challenge to raise awareness and funds to fight the disease last year. And while the stunt was hailed by some and ridiculed by others, it raised $17 million in Canada alone. Thursday, the ALS Society of Canada announced that money would go directly to research; $15 million will go to fund 34 research projects across Canada, including here at the Montreal Neurological Institute. Normally the group is only able to spend about 1.5 million a year, on average, on research, meaning that the ice bucket challenge has provided enough money to increase their grants tenfold. Carol Skinner has ALS and advocates on behalf of others dealing with the disease. She says the announcement makes her optimistic. “Everybody said, you know, you're terminal. That's it. There's no treatment but within this short period of time, two years I’ve had ALS, now there's hope, there's real historic research that now has the potential to find treatments and not only treatment but I’m hopeful for a cure,” she said. Organizers admit it's going to be hard to raise $17 million every year, so the society is looking for other ways to keep donations coming. The ALS Canada Research Program aims to accelerate research impact through a comprehensive national program focused on translating scientific discoveries into treatments for ALS and fostering Canada's strong and networked ALS research community to build capacity and collaboration. Support for the ALS Canada Research Program is made possible by the generosity of donors, the ALS Societies across Canada, Brain Canada and the federal government's Canada Brain Research Fund. On the anniversary of the announcement of the 2014 ALS Ice Bucket Challenge results and partnership between ALS Canada and Brain Canada, the ALS Societies across Canada and the ALS Canada Research Program in partnership with Brain Canada, are pleased to announce the final recipients of the 2015 grant competitions. 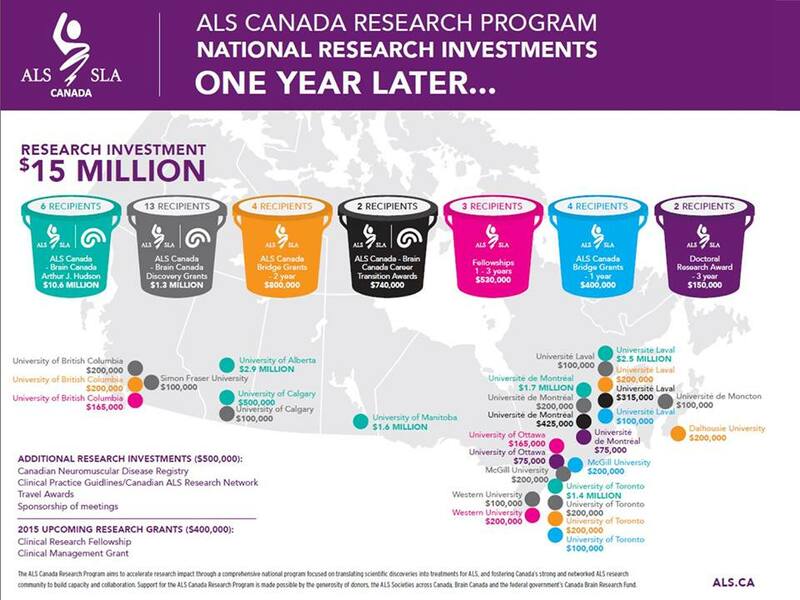 In one year, $15 million has been invested in the exciting ALS (amyotrophic lateral sclerosis) research in Canada, representing a ten-fold increase over historical annual commitments. "We are committed to funding the most promising research through the ALS Canada Research Program, to make ALS a treatable disease," said Tammy Moore, CEO of the ALS Society of Canada. "Never before have we had the financial resources to be able to fund multi-collaborative research projects across leading academic institutions to the extent we can today, it is because of the generosity of Canadians who embraced the ALS Ice Bucket Challenge and the investment from the federal government's Canada Brain Research Fund through Brain Canada. This important research brings hope to the 3000 Canadians living with ALS today, and the people who will be diagnosed in the future." "Brain Canada is proud to partner with the ALS Societies of Canada on their research program," said Inez Jabalpurwala President and CEO, Brain Canada Foundation. "Through this partnership, we have been able to attract researchers from different disciplines and institutions whose expertise covers a range of neurodegenerative diseases. This will accelerate our understanding of ALS, and bring us closer to improved diagnosis, treatment, prevention and ultimately a cure for this devastating disease." 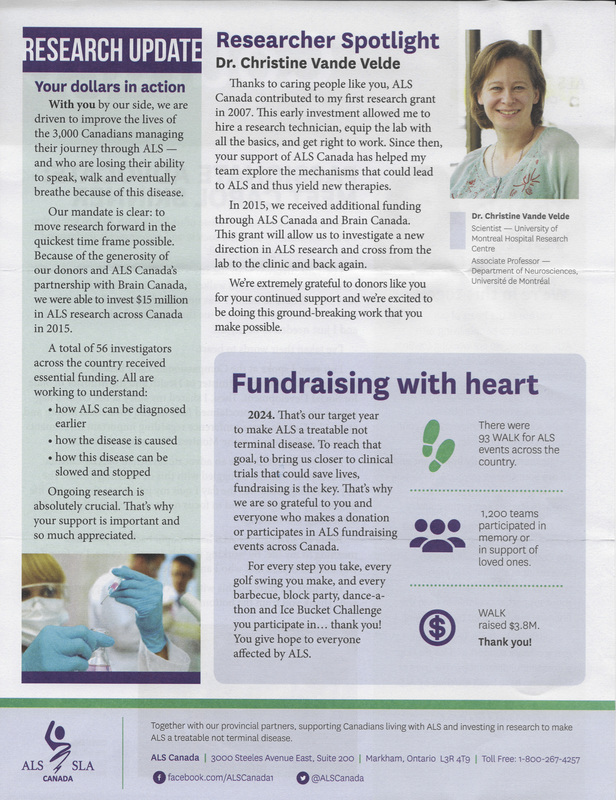 "Through funding from the ALS Canada Research Program and Brain Canada partnership, our research community can work together and tackle many different aspects of ALS to accelerate the discovery of treatments for ALS patients," said Dr. Christine Vande Velde, Scientist, University of Montreal Hospital Research Centre (CRCHUM) and associate professor, University of Montréal. "ALS research has come a long way in the past decade, and these research investments can only help further explore answers to this complex disease." While this year's landmark investment in research is a critical step forward, it's recognized that ongoing investments are essential to make ALS a treatable, not terminal disease. "We are pleased to be able to make these historical investments today, but it is critical to continue to raise significant funds in 2016 to support the ALS Canada Research Program so we can build on the momentum of discoveries we expect from these projects," states Tammy Moore. "Canada is positioned as a leader in ALS research, consistently in the top five countries for ALS discoveries and the ALS Canada Research Program has been a critical contributor to that success." 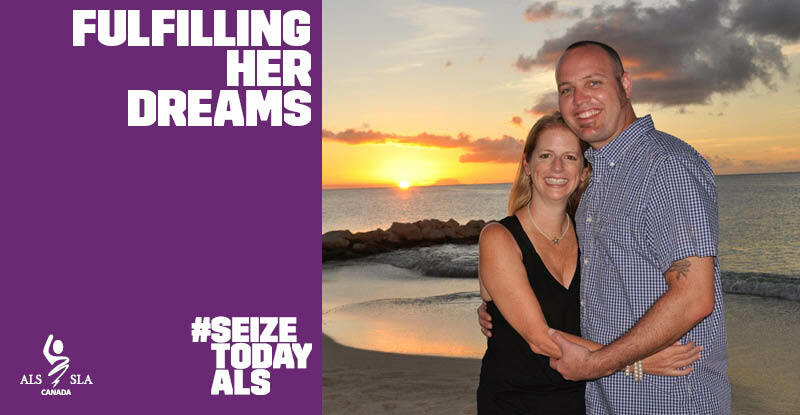 "Being given a diagnosis of ALS was devastating to myself and my family," said Carol Skinner, an advocate who was diagnosed with ALS in 2013 at the age of 41. "I felt frightened and alone. But seeing the tidal wave of support from our community through the Ice Bucket Challenge, and the potential of significant discoveries from the outcomes of the research projects announced today, inspires me to have faith that ALS will become a treatable, instead of terminal illness." Along with the funds allocated to research, an additional $4.4 million raised by the 2014 Ice Bucket Challenge was invested to support the day-to-day care of Canadians living with ALS. Approximately 2,500 to 3,000 Canadians are living with ALS today, and the average cost for caring for one person with ALS is between $150,000 and $250,000. 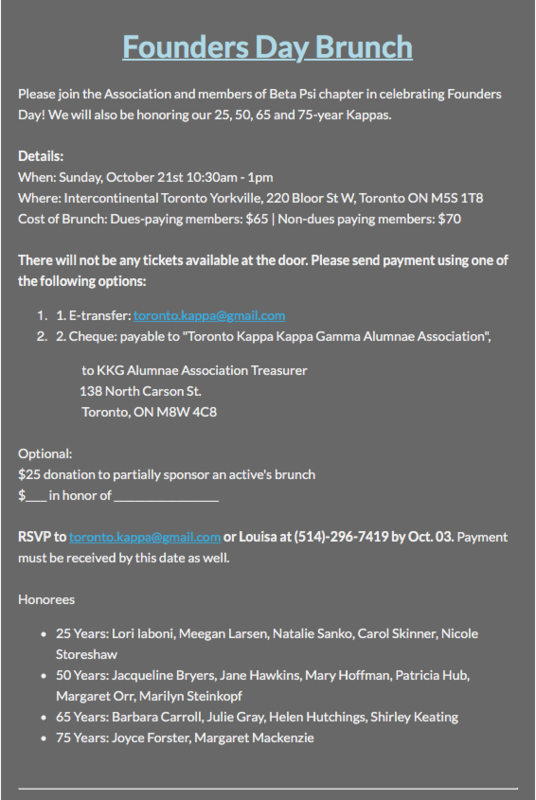 For more information regarding the investments for ALS research or to donate, please visit www.als.ca. My name is Carol Skinner and I was diagnosed with ALS on September 19th, 2013, at the age of 41. Exactly 2 years and one month ago today. The average survival rate for people living with ALS is 3 years. I am very conscious of time and do not take it for granted. Due to the incredulous timeline for those of us living with ALS, there is a sense of urgency in the necessity of discovering viable treatments options. I am very proud to be in Montreal today, to be a part of this historic announcement for ALS research. This is where I grew up, worked at summer camp, met my best friends, discovered my hopes and dreams, and graduated from McGill University, class of ’95. I never imagined that 20 years later I would be diagnosed with a devastating terminal illness. The day of diagnosis I went in for an EMG and walked out with 2 to 5 years left to live. It is a day that those of us living with ALS will never forget. An unwanted marker imprinted on our lives. I was working as an art therapist, facilitating groups for individuals with mental health and substance use disorders at the Canadian Mental Health Association. I had to give up my career that I was proud of because I lacked the strength in my muscles and experienced extreme fatigue. My husband Travis & I had to sell our home as it was a two floor walk up and I could no longer climb stairs. ALS, being a degenerative disease is terrifying to live with. Its progression takes away ability and autonomy. Day by day I discover activities I can no longer accomplish on my own. As a strong independent woman with (some might say) control issues, this is extremely frustrating! My story is not unique. This is a shared struggle. The history of this disease is over 140 years since definition. In 1874, Jean-Martin Charcot began using the term amyotrophic lateral sclerosis. It has been over 75 years that Lou Gehrig brought public awareness about ALS to the world with his “Luckiest Man on Earth” speech. It is unbelievable that in all the decades since that time, not only has no cure been found, but there is no treatment for this debilitating disease. One of the major reasons for this is that ALS is terribly underfunded. Today’s announcement proves that when a nation comes together, such as an event like the Ice Bucket Challenge, we can make a difference. Not only did the Ice Bucket Challenge increase worldwide understanding of ALS and its impact on the community, it raised millions of dollars. Together, with the Brain Canada partnership the funding of this important research represents the most promising potential for developing effective treatments against ALS. We need your help to keep going and continue the momentum. The Ice Bucket Challenge will occur every August Until A Cure, the Walks for ALS will continue annually, and fundraising events such as the one my father and his friend Amanda are hosting tonight at restaurant Table 09, continue to have significant influence in making ALS a treatable, not terminal disease. Because of this support, as an individual living with ALS, I no longer feel alone. I now have hope where I once had none. This is because of you. 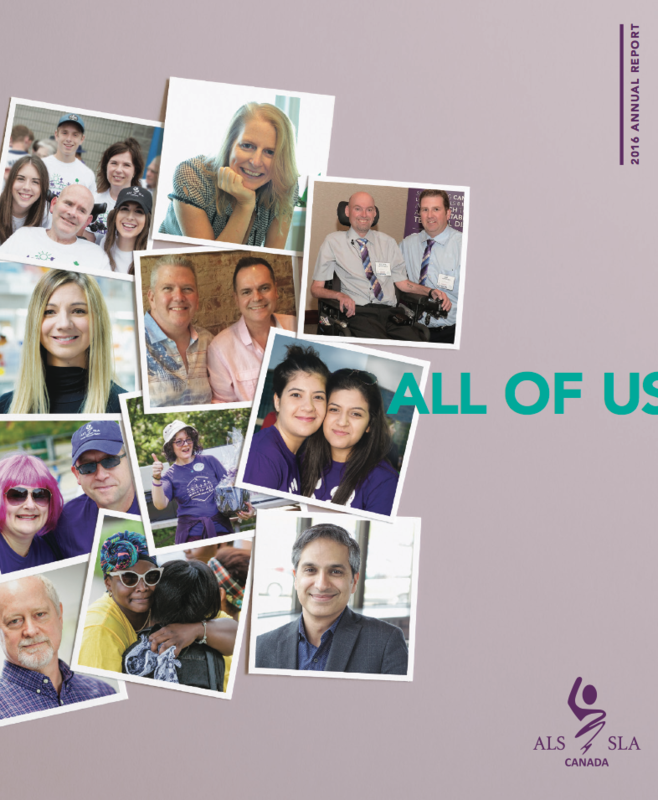 Every Canadian that has supported, donated, advocated and participated in fundraisers has made today possible and has proven that every single person has the ability to affect change. Thanks to this investment and continued investment in ALS research, I believe that making ALS history will be an inevitable accomplishment and a day we can all be proud to celebrate. ALS is a neurodegenerative disease where the nerve cells that control your muscles die. The 'living wires' which connect your brain to your muscles degenerate, leading to a loss of mobility, loss of speech and eventually impact the ability to breathe. This is a terminal disease. ALS does not have a cure nor an effective treatment. In Canada, approx. 2500-3000 people are living with ALS; 1000 will succumb to the disease and 1000 will be newly diagnosed each year. The lifespan after diagnosis is on average two to five years. Judy Starritt used to be quite the talker. In the summer of 2013, however, she noticed her tongue began to swell and her speech would slur. Several doctors’ appointments and an MRI later, they figured out what was wrong. In March 2014, Starritt was told she has amyotrophic lateral sclerosis, commonly known as ALS, a neuromuscular disease in which nerve cells die, paralyzing muscle movements like walking and talking. Today, her voice barely registers as a whisper. When walking through the airport, however, she’ll quickly chat with strangers about last summer’s ice bucket challenge and ask if they know someone who has ALS. If they say they don’t, she’ll respond, “you do now!” And then she’ll thank them. Those living with ALS have already seen tangible benefits with the money stemming from last year’s viral craze. Starritt sleeps with a bilevel positive airway pressure machine, also known as a BiPAP, to help with her breathing and give her diaphragm a little rest. During the day, a Cough Assist helps keep secretions, like mucus, clear from her lungs. Each machine costs about $5,000, and Starritt is thankful these two items won’t have to come out of her own pocketbook. She borrowed both indefinitely from the ALS Society of Nova Scotia and New Brunswick, which recently added five BiPAP and five Cough Assist machines with ice bucket funds. “You just sign a piece of paper and it’s yours for as long as you need it,” Starritt says. A year later, ALS Canada doesn’t want to let all the awareness simply dry up and disappear. On August 6th, groups across Canada will celebrate the one-year anniversary of the ice bucket challenge by asking people to dump cold water on their heads once again, and maybe think about donating once again. 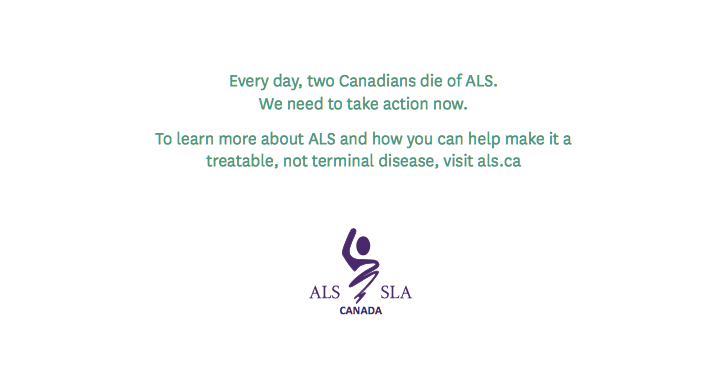 ALS is extremely expensive for the roughly 3,000 Canadians living with the disease. Homes and vehicles need to be retrofitted to make them wheelchair accessible. Special speakers are purchased to help amplify ones voice. Personal care workers are often brought aboard. The average cost to a Canadian family with a member diagnosed with ALS can be $150,000 to $250,000, according to ALS Canada. And for the 1,000 Canadian diagnosed annually, there is no cure or treatment. “I walked in for a medical appointment and I walked out with two to three years to live,” says Carol Skinner, who was diagnosed with ALS in September 2013 at the age of 41. She and her husband moved out of their Ottawa condo and into another apartment that was more accessible for her deteriorating condition. She stopped working as an art therapist with the Canadian Mental Health Association. She used to love skating the Rideau Canal; soon she could barely walk around the block. It was lonely feeling. But in the summer of 2014 when the Ice Bucket Challenge started to take off, her mindset changed. “All of a sudden, I felt the world had my back,” she says. From her local ALS support worker, Skinner is currently borrowing a wheelchair and a shower pole, which allows her to still get in and out of the shower independently. More importantly, she felt like people cared. When the Ice Bucket Challenge craze started to wind down in Canada last year, members from various ALS groups across the country had to figure out what to do with a $17 million windfall of money. 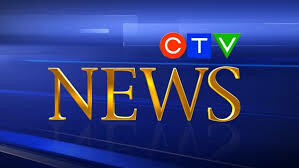 “When people dumped water on their head, were they thinking 100 per cent of the money should go to research or were they saying it should go for wheelchairs and equipment?” asks Lorne Zinman, a neurologist and director of the ALS Clinic at Sunnybrook hospital in Toronto. The answer, they reasoned, is a mix of the two. Each province pooled together a total of $10 million for research, an amount that was matched dollar for dollar by the not-for-profit neuroscience research organization Brain Canada. The remaining $7 million was split amongst ALS groups from each province, depending on where the donations came in from, for individual care. Her group also purchased two high-end power wheelchairs that can be controlled by head movements, ideal for when someone is no longer able to use hands or legs to manoeuvre. In total, they’ve spent $100,000 on new equipment thus far while the remaining funds are put aside to ensure the equipment loan program can keep going for years to come, as well as hire care workers. In a first for New Brunswick, Carter hired a full-time client services manager, who checks in with clients on a weekly or monthly basis to customize a care program and help them adapt throughout all the stages of their ALS. Back in the lab, as much as $10 million of ALS Canada’s $20 million dedicated for research will be made available this year via various grants. “It takes time and the money has to be distributed fairly in a peer-reviewed fashion,” Zinman says. “We’re not going to see changes overnight, but boy will things be forwarded fast with this windfall.” After all, never before has ALS Canada offered more than $2 million in grant money in a single year. Zinman explains the huge influx of cash has brought forward ideas that researchers previously balked at even attempting—like stem cell transplantation— because they figured trials would be far too expensive for approval. But with the ice bucket challenge money, anything feels possible. ALS Canada has already approved a $500,000 clinical trial for pimozide, in hopes that the anti-psychotic drug proves that it strengthens where motor neurons connect the brain to muscles, thereby allowing muscles to function longer. “In order to cure a disease, you don’t have to understand 100 per cent of it,” Zinman adds. “You have to understand a certain threshold about why the disease occurs and how it progresses. [With ALS], we’re not at that threshold yet.” But with a few more buckets of ice, maybe they will get there faster. After the ice-bucket challenge, what next for ALS? ALS Canada says the ice-bucket challenge raised $17 million to fight the debilitating disease. 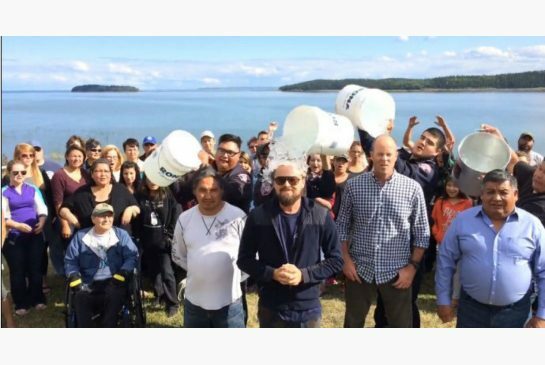 Leo DiCaprio issuing the ice bucket challenge to Prime Minister Stephen Harper. Carol Skinner remembers the moment she first saw the ice-bucket challenge. A big hockey fan, Skinner, 43, watched as a bucket of ice water was poured over Pittsburgh Penguins’ captain Sydney Crosby. Soon, everyone including Kermit the Frog was doing it, and, more importantly, talking about Amyotrophic Lateral Sclerosis (ALS), also known as Lou Gehrig’s disease. Diagnosed with the progressive, degenerative disease in the fall of 2013. Skinner was given just two to five years to live. As one of just 3,000 people living with it in Canada, she felt like she was on her own — until she saw thousands cheering for her survival online. Largely credited to two young Americans, Pete Frates and Pat Quinn, the ice-bucket challenge quickly became the meme of 2014, helping to raise more than a hundred million dollars worldwide for ALS. About 260,000 people donated to ALS Canada in just a few short months, earning a whopping $17 million over and above the $14 million the organization raised through its usual fundraising efforts. 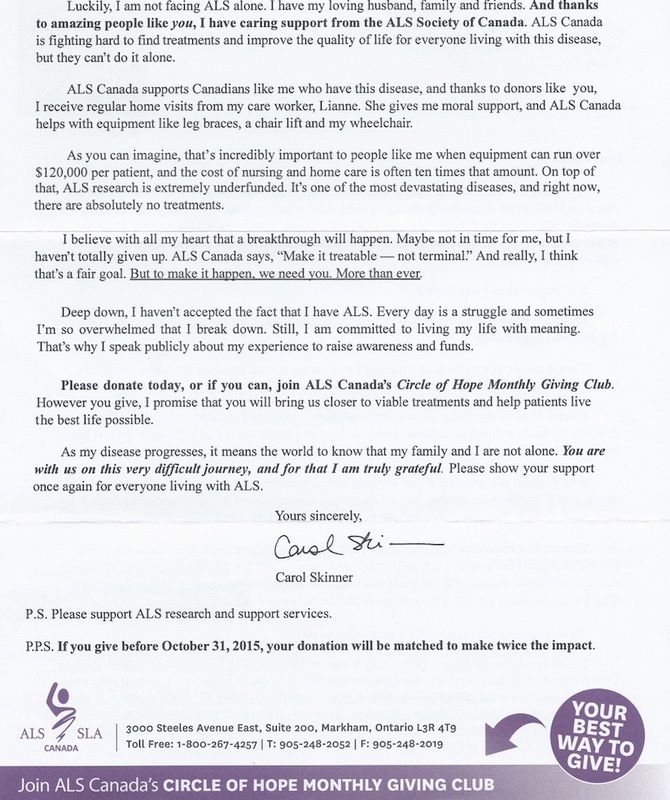 Tammy Moore, the group’s CEO, said after Crosby posted his video, she and her staff snapped to and created a way for Canadians to direct their donations to ALS Canada. “It wasn’t something that was planned by any of our organizations, but we were the very grateful recipients,” she said. Although its incidence rate, or the number of people diagnosed each year, is similar to that for multiple sclerosis, its high mortality means that the disease is one of the rarest, she says. It is also incredibly expensive. Moore estimates the cost of living with ALS to be between $150,000 and $250,000, including the cost of physical aids, lost income and emotional support. The $17 million raised by ALS Canada will be split between helping people living with the disease and funding research. About $7 million will go for support, while $10 million will go to research, in the hopes of finding a cure or treatment. Brain Canada, a government-funded brain research foundation, has matched these donations, bringing the total money available for research to about $20 million. Now, the organization must decide how to spend its riches, which comes with its own challenges. Should ALS Canada spend it all now, or spread it out over the next few years? Moore said they chose to do a bit of both, earmarking $10 million to be distributed in 2015, funding creative projects that are working towards a treatment. The rest will be distributed over the next couple years. Dr. Michael Strong, the dean of the Schulich School of Medicine and Dentistry at Western University, has been a pioneer in the field of ALS research for more than two decades. 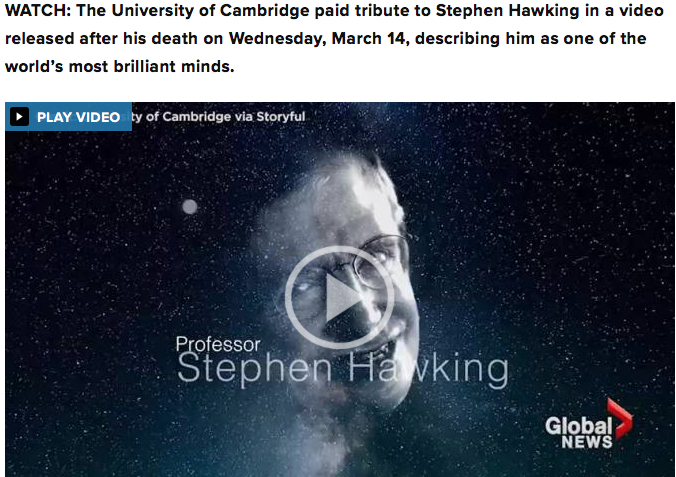 Although he no longer sits on the board of ALS Canada, he did for about 10 years. ALS is an incredibly difficult disease to understand, Strong said, because, by the time people are diagnosed, the disease is already very advanced. “Imagine you’re coming across a train wreck and somebody asks you to explain how it happened. You’re there at the end; that’s the problem,” he said. But because of the small number of people living with the illness, it can be a challenge to find funding, Strong said. Most of the money being distributed by ALS Canada will go to what are known as “bridge” grants, which invest in new ideas that might not be ready for some of the larger national health grants. “Those are hard grants to get,” he said. Often researchers find their budgets trimmed by up to 30 per cent, which makes their initial proposal all but undoable. Moore is quick to note that if Canadians want to see this kind of exploratory research continue, they will need far more than just $17 million. “The reality is that really is a drop in the bucket for what’s required,” she said. Moore doesn’t expect lightning to strike twice, and knows that the funds raised by 2014 ice bucket challenge are unlikely to be matched in later years. Still, she hopes people who gave once will give again. Skinner said she and other advocates hope to bring the challenge back this August, and every August, until there’s a cure. But in addition to the money, everybody agrees that one of the biggest gifts the ice-bucket challenge was an increased awareness of the disease, which, for so long, had flown below the radar. When Strong first started treating the disease in the 90s, there was little knowledge of it, Moore. “I would spend a lot of my time just explaining to families what it was,” he said. But since the ice-bucket challenge, people have come to him with knowledge of their own. 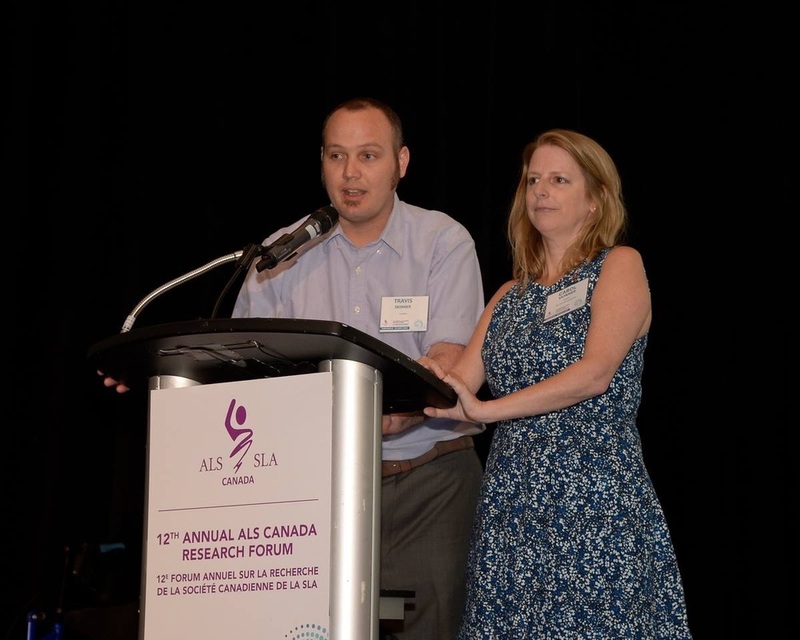 Moore said this increased awareness helped ALS Canada successfully lobby for a longer leave for compassionate care, and for helping people living with the disease feel less isolated. 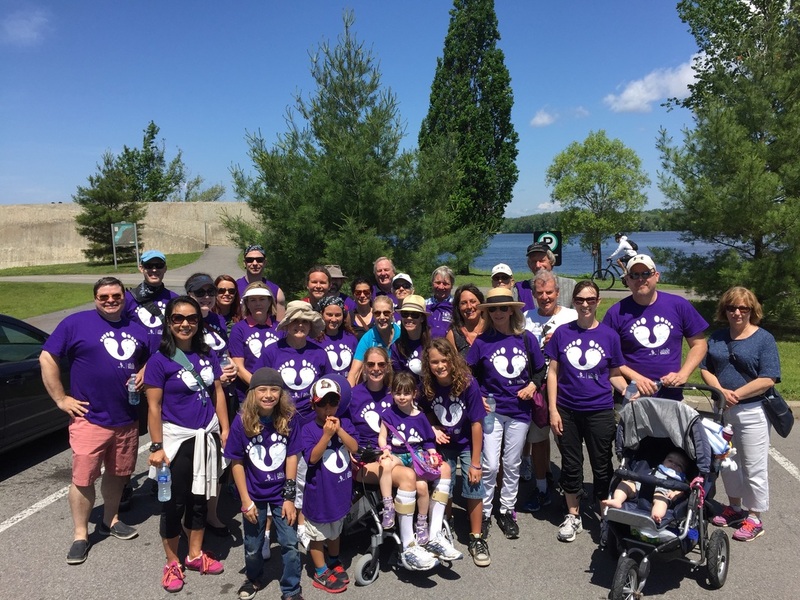 Well over 1,000 marchers in stylish purple shirts took to the Parkway and other arteries in Ottawa Saturday to raise funds for Amyotrophic Lateral Sclerosis (ALS), more familiarly known as Lou Gehrig’s disease. ALS sufferer Carol Skinner, whose struggle with the incurable disease was documented by columnist Kelly Egan earlier this month, was at the head of the parade as it left the Canadian War Museum in LeBreton Flats, sent off by an pipe and drum band. The purple wave wound its way through the city’s west end. ALS organizations had set a target of $210,000 for donations and, early in the march, were confident the target had been met. For more information on the research or walks in your area, visit walkforals.ca. Carol Skinner, who is living with ALS was in the lead in the ALS Walk that kicked off at the Canadian War Museum Saturday. At the time, I was working at the Canadian Mental Health Association as an art therapist facilitating groups for individuals with severe mental health and substance use issues. I was proud of the work I did, and good at it too! I had been having some falls and stairs were getting difficult to climb. When I would go for my favourite Chai Latte across the street from work, it became harder to dodge traffic! One afternoon I left work early for a medical appointment, to have an EMG. I thought that the needles in the muscles was going to be the worst part, but of course, the diagnosis of ALS was unimaginable and one that changed mine and my husband Travis’s lives forever. As you well know, ALS is a devastating illness with no treatment, no cure, and one that leaves us as who we are on the inside, while taking away our physical abilities. Day by day, we discover things we can no longer do. Some markers for me were not being able to get up of the floor, keep my balance or even step up onto a single curb. I used to be an adventurous person, I swam with sharks, pet cheetahs, and have gone spelunking. Now, I live in fear of even going outside not knowing what I can and cannot do. There are many times when I feel like I’ve lost myself and who I am altogether. That’s where you come in. The times when I feel that I am not brave, or strong, and that I cannot handle this, I am surrounded with love and support from friends and family telling me that I am an inspiration to them. I feel privileged to have been asked to be the lead walker this year as I have been struggling with how to find a sense of purpose after my diagnosis. This is the most meaningful speech I was invited to give because I am here to thank you for being here. Your support means more to us living with ALS than you can ever imagine. This is where we find hope. Thank you to the caregivers, who tell us that we are worth it, that it is a privilege to help us, that you want us to stick around! And for those of you here today walking for those who have passed, I am so impressed that you honour their memory by continuing to fight against this oppressive disease. Thank you to the volunteers, who work diligently to raise awareness for ALS. It takes months to make days like today a success. Thank you to the ALS Clinic who treat us with compassion, kindness, a sense of humour and respect. The past year has been incredible for those of us living with ALS in inspiring hope, because of the increase in awareness and advocacy in two significant ways. The Ice Bucket Challenge happened during my first summer with ALS and it was encouraging to see such a worldwide show of support and solidarity. My personal favourite was Kermit the Frog’s! Before, when wearing my leg braces, people would ask me what happened and when I would get better, they did not comprehend when I told them that I wasn’t getting better, in fact, my nerves and muscles were quitting on me and that I would die from this, and soon. Now when people ask, I mention the Ice Bucket Challenge and a lightbulb goes off, “Oh, yes, I did that!”. It raised 17 million dollars towards research and client care in Canada alone and increased the public’s understanding of ALS. It raised awareness for the whole world and my hope is that the millions of people who participated continue to be engaged with ongoing efforts that will impact the ALS community. Thank you for being here to continue to raise funds to feed research. Those of us living with ALS are desperate to maintain some sense of hope, and for that we need your help. Thank you to the researchers who work towards making ALS a treatable, not terminal illness. Thank you to all of those who advocate in support of ALS. 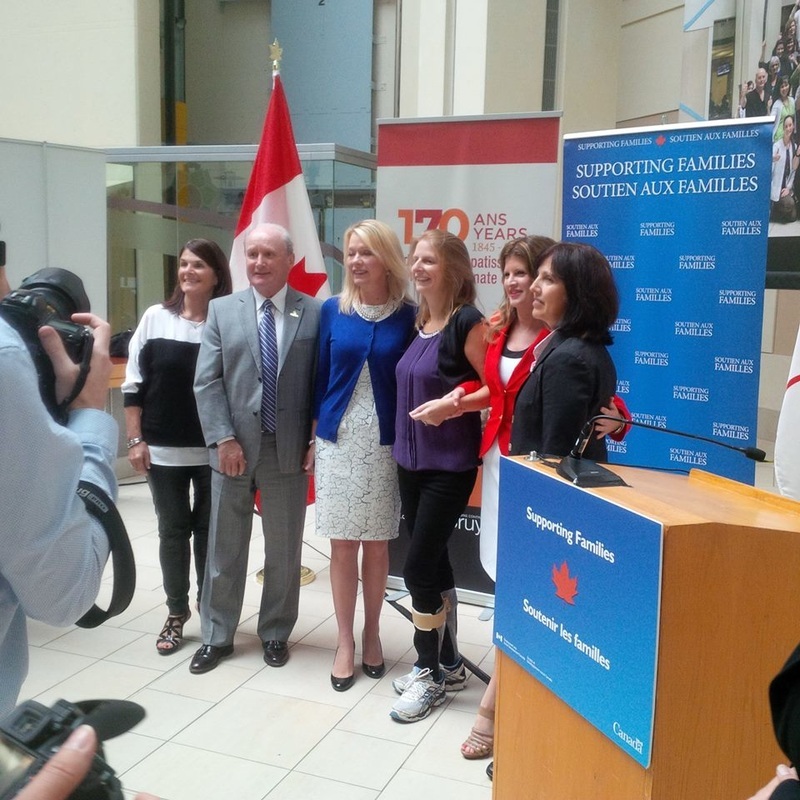 Due to the tenacity of the ALS Society of Canada and Brian Parsons the Government of Canada extended the Compassionate Care Benefit from 6 to 26 weeks, a benefit that will directly provide financial assistance to Canadian families caring for a loved one with a terminal disease. “Guess it comes down to a simple choice really. Get busy living, or get busy dying”. Egan: Only two or three years to live. What to do, right now? On Sept. 19, 2013, after a needle probed her wonky muscles, Carol Skinner was given the test results straight away: Her life was ending, soonish and cruelly. ALS, or Lou Gehrig’s disease, the neurologist said. Count on two or three years, maybe five. And they will not be great ones — so ready yourself, travel, move houses, right now. She stopped working the very next day. Husband Travis called her parents, who were on a Mediterranean cruise — she could barely form words — and they jumped ship, flew home. “My career was ripped from me, my home was ripped from me, my future. It was devastating.” She smiles keenly as she says this, a habit or defence she’s picked up, all the more to break your heart. Montreal-born, the youngest of three, Skinner is 43. She walks with lower leg braces now and can manage short distances; otherwise there are manual and electric wheelchairs to get around. All in all, she is holding up fairly well, though she can feel the advance of the muscle disease, for which there is no cure. Who ever thinks about time, whether we have bushels more, or just drops? The terminally ill do. And Carol Skinner wants to concentrate on the living part, not the dying part. Skinner, a McGill graduate, is a natural leader. She was a longtime camp counsellor and, at the time of diagnosis, was an art therapist with the Canadian Mental Health Association, working with some of the city’s most vulnerable citizens in group settings. So, sitting still was not to be. She agreed to be a lead walker and spokeswoman for ALS during the annual fundraising walk on Saturday that leaves the Canadian War Museum at 11 a.m. (www.walkforals.ca/ottawa for more info.). Travel has always been a passion of hers so, with the financial help of family, she hit the road. You can see a great deal in two years: Thailand, Singapore, Hong Kong, Japan, San Francisco, Antigua, Mexico, Italy, the Mediterranean, bringing her life travel list to about 30 countries. She discovered she had the remarkable support of extended family. Travis, a chef, is originally from South Africa. His brother Dayne and Dayne’s wife Kate have actually moved to Ottawa from New Zealand for a year to lend a hand. All of which to say this: Carol’s illness has spread a different kind of urgency through her circle of family and friends, a resetting of life priorities, be you sick or well. ALS, or amyotrophic lateral sclerosis, is a disease that attacks the nerve cells and leaves muscles paralyzed. There is no cure and little treatment. The need for funding is great: it can cost the average patient $150,000 out of pocket. Skinner said she first noticed something was wrong in 2013 when she began to trip unexpectedly from a “dropped foot” condition. An active person, she began to suffer fatigue and avoid stairs. She noticed her cup was shaking during tea breaks. She fell in Billings Bridge Shopping Centre. There were tests and more tests, an eventual trip to neurology. After diagnosis, Carol and Travis put their Crystal Beach condo on the market because it had a second floor. They moved to an apartment in Kanata, then moved again when a unit came available with a walk-in shower. It will be like this to the end: Constant adaptation. The couple are grateful for the federal government’s expanded compassionate care leave, which they will need. Carol Skinner skated circles around her South African husband when she first took him to the Rideau Canal. But when they hit the ice again the following year, her legs stopped working. Her stumbling continued off-ice. She fell in the airport en route to her brother-in-law’s wedding and she collapsed again on the dance floor. On Sept. 19, 2013, after doctors’ visits and tests, she was diagnosed with Amyotrophic Lateral Sclerosis (ALS) – the terminal progressive disease characterized by muscle paralysis. If you recently dumped a bucket of ice water on your head for a charity video, then you may be aware of the condition also called Lou Gehrig's disease. The day of her diagnosis, Skinner quit her job as an art therapist with the Canadian Mental Health Association and went on long-term disability. With her husband, Travis, the pair sold their two-storey condo and moved to Kanata. 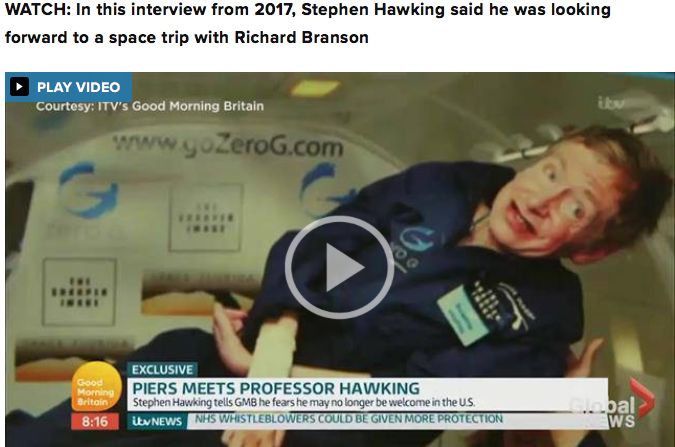 The 43-year-old shuffles around on leg braces and uses a wheelchair when they go on cruises, like when they went to southeast Asia last April. According to Lianne Johnston, regional manager of ALS Canada for Eastern Ontario, 2,500 to 3,000 Canadians are living with ALS. Almost half – 1,000 – are in Ontario. The ALS Ice Bucket Challenge drummed up almost $16 million for research and support last summer. "I don't want to say it was a fad. It was bigger than that," she said. "It was so supportive and we need things like that to keep going." Skinner will be the lead walker for the Walk for ALS on June 13. There will also be a flag-raising to commemorate ALS month at City Hall on Monday. In her initial appointment, Skinner was given two to three years to live. This September, two years later, she plans on hosting a party. “I’m going to celebrate it as much as I can,” she said. Carol Skinner, is 43 years old and lives in Kanata with her husband Travis. They have been married for five years. Carol used to love to hike … and dance … and be active. Travis will tell you she loves reggae. On September 19th, 2013, at the age of 41, Carol received devastating news. She was diagnosed with Amyotrophic Lateral Sclerosis (ALS). ALS, also known as Lou Gehrig's Disease, is a progressive neuromuscular disease in which nerve cells die and leave voluntary muscles paralyzed. Every day two or three Canadians die of the disease. The average life expectancy after diagnosis is three to five years. Carol has a Masters in Art Therapy and, until her diagnosis, worked for the Canadian Mental Health Association counseling clients and training people in the community to help individuals with substance abuse and mental health issues. Prior to becoming a therapist, Carol worked for the YMCA for ten years. She started as a camp counselor and grew to become a camp director. Carol is a recipient of the YMCA’s Outstanding Service to Youth Lifetime Achievement Award. The first thing one realizes after meeting Carol is that she is a truly loved woman. With her husband by her side and her family from New Zealand having taken up residence in their home to care for her, she and Travis feel blessed. They are surrounded by friends who help them in any way they can. Her blog (www.livelovelaughwithcarol.com) provides her with a venue to keep friends and family up to date with her life and the ongoing progression of the disease. Still a vibrant, outgoing woman, Carol says that she has watched herself go from an adventurous person to living in fear. Now she can only walk a few steps at a time, with braces on her legs, and cannot carry anything or get up if she falls. Her first symptoms began to appear in February of 2013, when she had difficulty skating on the Rideau Canal. At first, Carol, who had always been the one to “push Travis around on the Canal,” thought she needed to get fit again after a long winter so she began to exercise. She tried walking and running to get fit but began to trip and fall. After a series of events where Carol continued to lose her balance, she sought the advice of a doctor, who referred her to a neurologist. It was then that she and Travis were given the devastating news. Carol has had to make many adjustments in a relatively short time. She has had to leave her career behind. She and Travis have had to sell their first home together because it had stairs. They have lived in their Kanata apartment for less than a year and are moving again at the end of May where the new apartment layout will accommodate her wheelchair. Since her diagnosis, Carol has become a strong advocate of the move to increase compassionate care benefits, part of an existing EI plan, from 6 weeks to 26 weeks. She says the new plan will mean a great deal to her and Travis. However, ALS advocates will tell you that six months is not enough. Time is precious and it is difficult to predict how quickly, or how slowly the disease will progress. This can place an incredible strain on families and caregivers. I would like to thank everyone who has worked for the Compassionate Care Benefit Increase and made it happen. Especially ALS Canada and Brian Parsons for their awesome advocacy. On behalf of those of us who are suffering, thank you for making this necessity become a reality.